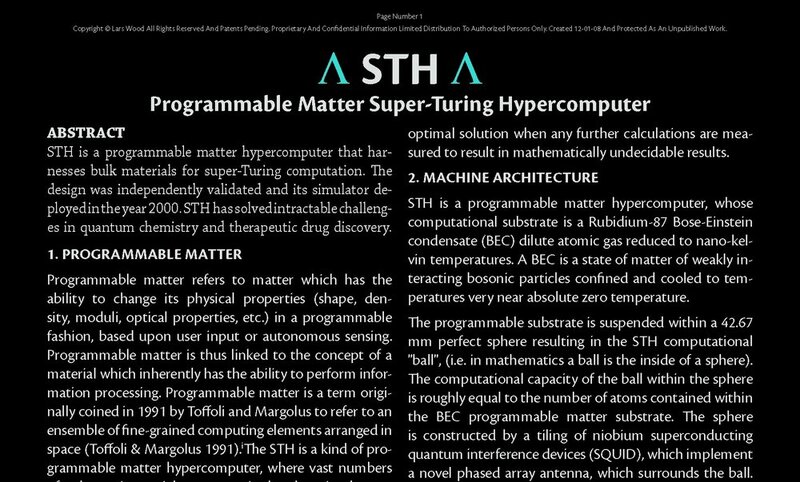 First is a published paper of an optical electronic computing system that laid the groundwork for the QAI SPECTRE™ super Turing technology. The paper was requested by the United States National Security Agency Super Computing Research Center and Intel corporation. The resulting IEEE peer reviewed published paper was the basis for invited talks at the Santa Fe Institute by scientist Dr Stuart Kauffman, Los Alamos National Laboratories Theoretical "T" Division (at the invitation of the late Dr Brosl Hasslacher), Sandia National Labs, Xilinx Corporation by personal invitation of the Xilinx late Founder Bernie Vonderschmitt and the MIT Media Laboratory by personal invitation of the late Dr Stephen Benton founding member of the MIT Media Laboratory. The unpublished second paper describes a programmable matter computing architecture that laid the ground work for the QAI SPECTRE™ super Turing technology where message propagation simulates a quantum diffusion process. The second paper was an invited paper produced at the request of a private company. The architecture described in the second paper received preliminary validation in 2001 as a realizable engineering development by Hypres, a premier superconducting electronics company in Elmsford NY. More papers will appear here as they are posted.